Lee Morgan, not yet twenty years old at this writing, is here represented for the fifth time as the leader of a Blue Note recording session. His fantastically rapid growth (technically and musically) as witness previous efforts, along with this one, places him beyond the "upcoming" or "potential" status into the ranks of those whose potential has been realized. Lee stands, right now, as one of the top trumpet players in modern jazz. As the title states, Lee is a "Cooker." He plays hot. His style, relating to the Gillespie-Navarro-Brown school, is strong and vital. There is enthusiasm in his music. A kind of "happy to be playing" feeling that is immediately communicated to the listener. Lee's later three Blue Note offerings have been set within the sparkling context of tunes written, mostly, by the provocative Benny Golson. Herein he reverts back to the format of his first recording, playing in a less "strict" atmosphere and just plain wailing throughout. "A Night In Tunisia" (Dizzy's tune which has been lee's showcase vehicle since he joined the Gillespie organization) leads off the set. Lee's solo is easily his best on record. Played with an almost frenetic forcefulness, it has a sharp, biting excitement about it that (as is also true of Pepper Adams' solo) is in keeping with the oriental-mysterious flavor of the piece. Bobby Timmons' statement is swift and effective and Philly Joe Jones drives the group in magnificent fashion. "Heavy Dipper," by Lee, is (contrary to the title) a light item with a pretty unison theme. Lee, Pepper, Bobby and Paul Chambers each demonstrate their instrumental prowess before Lee and Pepper exchange several sets of fours with Philly, which are followed by a return to the theme. Cole Porter's "Just One Of Those Things," a favorite of quite a few modern jazz musicians, is played at a fast, driving tempo. Pepper, Lee and Bobby (in that sequence) solo in an energetic manner that precedes a moving brace of horn and drum exchanges. The mournful "Lover Man" provokes a pensive mood through exquisite, beautifully constructed statements by Lee, Bobby, Pepper and Lee again. Both horns echo the old Charlie Parker-Howard McGhee version in the ending. Lee's "New-Ma" is a minor-keyed opus which, after the theme, features moody, expressive solos by Bobby, Paul, Lee and Philly. 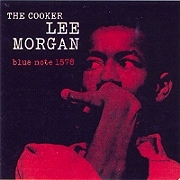 After listening to this album it will be hard to deny that Lee Morgan is, as they say, "something else." The enthusiasm of youth that is naturally his is now merged with a "pro's" sense of control that should enable him to advance onto even greater heights than he has thus far reached. A little over a month after the City Lights session, Morgan returned to the studios to cut his fifth Blue Note album in less than 11 months, and it is the first that can be considered a blowing session in the classic Blue Note manner, fully justifying the title The Cooker. Here the program is the stuff of numerous jam sessions and pickup gigs--standards from the jazz and pop music worlds, plus two straightforward Morgan originals. Paul Chambers teams with Philly Joe Jones, his partner in Miles Davis's quintet; and the pianist Bobby Timmons, who made his own recording debut as a teenager on Blue Note the previous year with Kenny Dorham (Round About Midnight At The Cafe Bohemia). He and Morgan would be close collaborators between 1958 and '61, as members of the Jazz Messengers with Benny Golson, Hank Mobley or Wayne Shorter in the tenor saxophone chair, and on such memorable projects as Morgan's 1960 album Leeway. Pepper Adams, who made his Blue Note debut here, was a veteran of the Detroit jazz scene and jobs with Stan Kenton, Maynard Ferguson and Chet Baker who would in time form a cooperative group with Donald Byrd that recorded for Blue Note under Byrd's name.